On the lookout for a cheap tablet? Walmart has some brilliant offers. Here's our pick of the best. Welcome to our guide to the best cheap Walmart tablet deals in 2018. Walmart is an excellent choice if you're looking for a budget tablet, thanks to its wide selection of tablets, competitive prices and free delivery – and with a host of Walmart Black Friday deals already live, it's safe to say this is the best time of year to buy a tablet from the retailer. However, due to the wide selection of budget slates on offer, it can be hard to find which one is right for you, which is where this list of the best best cheap Walmart tablet deals comes in. We've scoured the Walmart website to find the very best budget tablets on offer, as well as checking deals for the biggest savings. When buying a cheap tablet, there are a few things to take into consideration. First of all is size. The smaller the screen, the more easily portable it is, and the lower the price is likely to be as well. But, smaller screen makes working, drawing and watching media on the tablet more tricky. You'll also want to keep an eye on resolution. Many budget tablets cut corners by offering low resolutions. While this keeps the price low, it also impacts image quality. The more RAM a tablet has, the better it will be at running multiple apps at once, and you'll want plenty of storage space as well to store photos, apps, videos and music. A microSD slot to expand storage would also be welcome. So with all that in mind, here's our pick of the best cheap Walmart tablet deals in 2018. 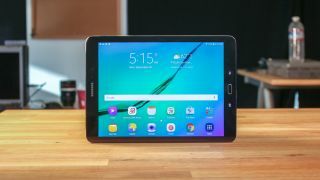 If you don't mind going for a slightly older tablet, then the Samsung Galaxy Tab S2 offers brilliant value for money, making it our pick for the best cheap tablet at Walmart. It offers 32GB of internal storage, which is plenty for most people, and you can even expand it with a microSD card (up to 128GB) for extra space. Its screen is gorgeous as well, with a 2,048 x 1,536 Super AMOLED display and enough powerful innards to keep this tablet running quickly and smoothly despite its age and budget price. The Lenovo Tab 4 8 is a brilliant cheap tablet often sees excellent deals from Walmart. It's a strong all-rounder that offers you a good screen, very good battery life and a design that wouldn't look out of place on a more expensive tablet. The Lenovo Tab 4 8 is a great showcase for cheap tablets, as it proves that you don't have to have a cheap-feeling tablet that lacks features just because you're on a budget. Sure, it might not get the latest version of Android in the future, but for a cheap tablet that ticks a lot of boxes, this is definitely worth looking into. iPads aren't the first tablet you think of when looking for cheap devices, but Apple's iPad mini 4 is a brilliant little tablet that comes with Apple's renowned build quality and design, but for an affordable and, dare we say it, cheap price. The latest version comes with a screen upgrade and more powerful components. Walmart has a range of great deals on this cheap and small tablet. It's not quite as cheap as other cheap tablets from Walmart on this list, but if you love Apple's products, it's one of the cheapest ways to get that iOS experience. If you're after something a little bit more powerful, then Microsoft's affordable Surface Pro is an excellent choice. It has a brilliant build quality, and Microsoft has packed in powerful components that means it can handle apps and games with ease. Unlike most of the cheap tablets on this list, the Surface Go runs Windows 10 S. You can upgrade this to the full version of Windows 10, which means you can run programs such as Photoshop, making this a versatile cheap tablet from Walmart. The Samsung Galaxy Tab E Lite is one of the best cheap tablets on sale at Walmart thanks to Samsung's deserved reputation for producing quality budget tablets that pack plenty of features into nicely-designed bodies, while not costing a fortune either. It's small and light enough to be easily carried around, and it comes with a microSD slot, which means you can easily expand its storage capabilities if you want to fill it with videos and music. It comes with an old version of Android, but this can be updated, though it may not get the newest version of Android in future. Still, it's a brilliant cheap tablet that often sees some impressive deals at Walmart. Here's another brilliant cheap tablet from Samsung, which you can get some great deals on if you shop at Walmart. The Samsung Galaxy Tab A has an excellent battery and impressive specs for the price, and it runs modern Android apps without any issues. With a screen size of 7-inches, this is a small and portable cheap tablet that is easy to carry around with you. It's not going to be that great for watching movies on or for creating digital art, but it's a great little tablet to take with you when you're out and about. If you're looking for one of the absolute cheapest tablets available at Walmart, then the RCA Voyager 7-inch 16GB Tablet is worth looking into - but with caution. For less than $40, you're getting an Android tablet with a 7-inch screen, so for people who are thinking of getting a cheap tablet from Walmart to use as a spare device that you can carry around with you, then this will fit the bill nicely. However, to get such a low price, it does mean the build quality isn't that great, and it lacks power where it counts. But for the price, these compromises may be worth it for many people. The Ematic EGQ223BL 10-inch tablet is another very cheap tablet from Walmart which, as long as you don't expect too much from it, is pitched at a very tempting price. You get a large 10-inch screen and 16GB of storage space, which can be expanded with a microSD memory card if you need to store more videos, photos and files on it. Again, like the RCA Voyager above, it's not the fastest or most powerful tablet in the world, but for the price you get a pretty handy tablet that can keep you (or your kids) entertained.